Lindblad Expeditions released a new Baja Mexico itinerary called Baja California Odyssey: San Ignacio Lagoon and the Sea of Cortez, a photo expedition that explores the Sea of Cortez, one of the best places for observing marine mammals in the world. This sails Jan. 11, 2012 from La Paz, Mexico for 11-days/10-nights aboard the 62-passenger National Geographic Sea Bird. Joining Lindblad’s expedition team on this special sailing will be National Geographic photographer Susan Seubert, a recipient of Life Magazine’s Alfred Eisenstaedt Award, editorial photographer and photojournalist, along with two Lindblad-National Geographic-certified photo instructors. 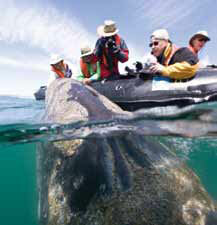 They will assist passengers in shooting wildlife photos while on trips by Zodiac, kayak, or walks.